Cassini has been in the news lately: Wired.com recently featured a story on Cassini and I was interviewed by eCommerceBytes. Given the interest in the topic, this week’s post is more on the inside Cassini story. At the end of 2010, we decided that we needed a new search platform. We’ve done great work in improving the existing Voyager search engine, and it had contributed substantially to the turnaround of eBay’s Marketplaces business. But it wasn’t a platform for the future: we needed a new, modern platform to innovate for our customers and business. We agreed as a team to build Cassini, our new search engine platform. We started Cassini in around October 2010, with a team of a few folks lead by industry veteran Nick Whyte. Our Voyager search engine was built in around 2002. It’s delivered impressively and reliably for over ten years. It’s a good old workhorse. But it isn’t up for what we need today: it was architected before many of the modern advances in how search works, having launched before Microsoft began its search effort and before Google’s current generation of search engine. We’ve innovated on top of Voyager, and John Donahoe has discussed how our work on search has been important. But it hasn’t been easy and we haven’t been able to do everything we’ve wanted – and our teams want a new platform that allows us to innovate more. 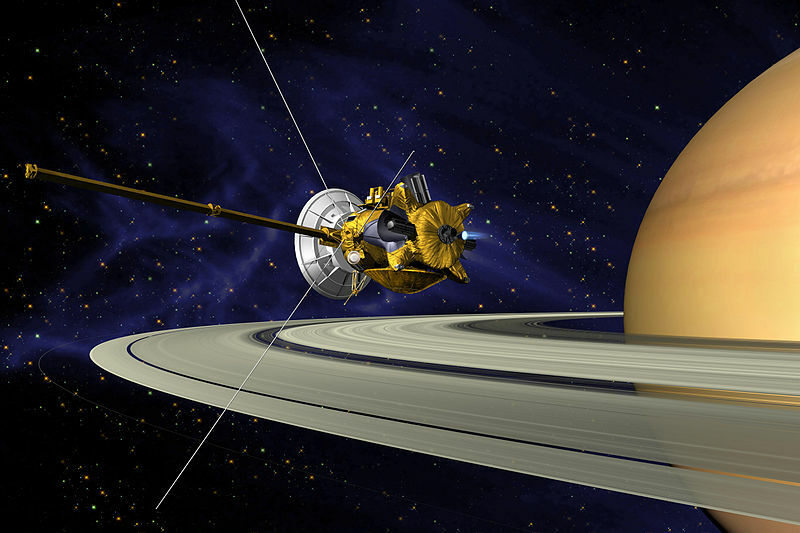 Since Voyager was named after the late 1970s space probes, we named our new search engine after the 1996 Cassini probe. It’s a symbolic way of saying it’s still a search engine, but a more modern one. The Cassini-Huygens probe, the namesake of our Cassini search engine. Cassini is a true start-from-scratch rewrite of eBay’s search engine. Because of the unique nature of eBay’s search problem, we couldn’t use an existing solution. We also made a clean break from Voyager – we wanted to build a new, modular, layered solution. January 2011 marked the real beginning of the project. We’d been working for three or four months as a team of five or so, and we’d sketched out some of the key components. In 2011, we set the project in serious motion – adding more folks to the core team to begin to build key functionality, and embarking on the work needed to automate search. We also began to talk about the project externally. In 2012, we’d grown the team substantially from the handful of folks who began the project at the end of 2010. We’d also made substantial progress by June – Cassini was being used behind-the-scenes for a couple of minor features, and we’d been demoing it internally. In the second half of 2012, we began to roll out Cassini for customer-facing scenarios. Our goal was to add value for our customers, but also to harden the system and understand how it performs when it’s operating at scale. This gave us practice in operating the system, and forced us to build many of the pieces that are needed to monitor and operate the system. The two scenarios that we rolled out Cassini for in 2012 were Completed Search worldwide, and null and low search in North America. Mark Carges talked about this recently at eBay’s 2013 Analysts’ Day. Completed search is the feature that allows our customers to search listings that have ended, sold or not; it’s a key way that our customers do price research, whether for pricing an item they’re selling or to figure out what to pay when they’re buying. Because Cassini is a more scalable technology, we were able to provide search over 90 days of items rather than the 14 days that Voyager has always offered. When users get no results from a query (or very few), Voyager offered a very basic solution – no results and a few suggested queries that you might try (this is still what you’ll see on, for example, the Australian site today). Cassini could do much more – it could help us try related queries and search more data to find related matches. After customer testing, we rolled out Cassini in North America, the UK, and Germany to support this scenario – a feature that’s been really well received. In January 2013, we began testing Cassini for the default search with around 5% of US customers. As I’ve discussed previously, when we make platform changes, we like to aim for parity for the customers so that it’s a seamless transition. That’s our goal in testing – replace Voyager with a better platform, but offer equivalent results for queries. 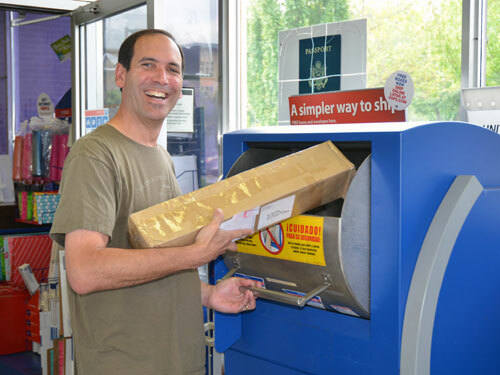 The testing has been going on with 5% of our US customers almost continuously this year. Parity isn’t easy: it’s a different platform, and our Search Science and Engineering teams have done great work to get us there. We’ve recently launched Cassini in the US market. If you’re querying on ebay.com, you’re using Cassini. It’s been a smooth launch – our hardening of the platform in 2012, and our extensive testing in 2013 have set us on a good path. Cassini doesn’t yet do anything much different to Voyager: for example, it isn’t by default searching over descriptions yet. We’ll begin working on making Cassini the default search engine in other major markets later in the year. We’re beginning to test it in the UK, and we’ll work on Germany soon too. There’s also a ton of logistics to cover in launching the engine: cassini requires thousands of computers in several data centers. We’ll also begin to innovate even faster in making search better. Now that we’ve got our new platform, our search science team can begin trying new features and work even faster to deliver better results for our customers. As a team, we’ll blog more about those changes. We have much more work to do in replacing Voyager. Our users run more than 250+ million queries each day, but many more queries come from internal sources such as our selling tools, on site merchandizing, and email generation tools. We need to add features to Cassini to support those scenarios, and move them over from Voyager. It’ll be a while before Voyager isn’t needed to support a scenario somewhere in eBay. We’ll then turn Voyager off, celebrate a little, and be entirely powered by Cassini. This entry was posted in technology and tagged cassini, ebay, search engines, voyager on July 8, 2013 by Hugh E. Williams. 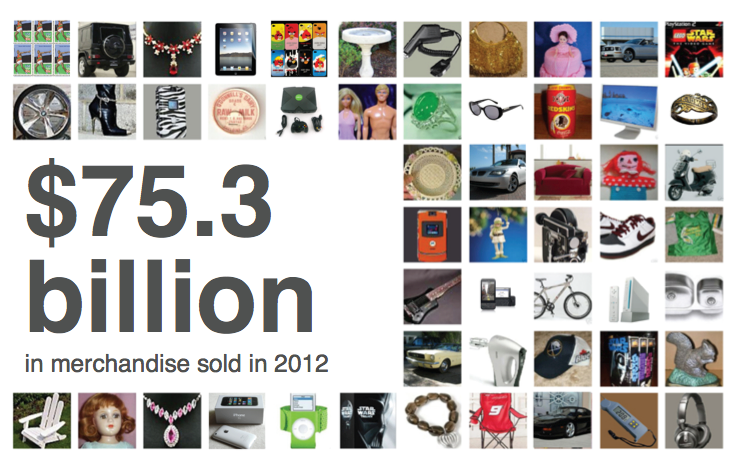 It’s time for an update of the eBay Marketplaces interesting statistics that I shared last year. eBay Marketplaces means we’re the team that builds ebay.com, ebay.co.uk, ebay.de, ebay.com.au, and most of the other worldwide marketplaces under the eBay brand. 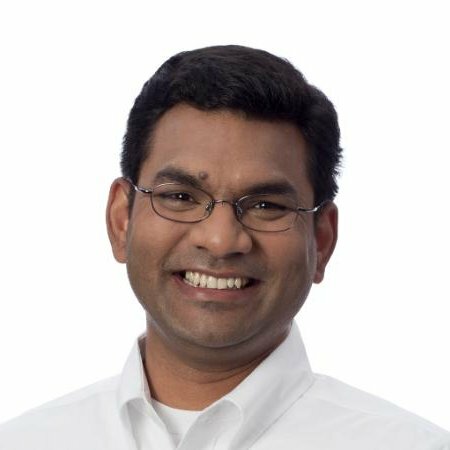 eBay’s an exciting place to be — plenty of engineering, business, and commerce challenges that are driven by users, items, traffic, and sales. See you next week. This entry was posted in technology and tagged ebay on June 24, 2013 by Hugh E. Williams. 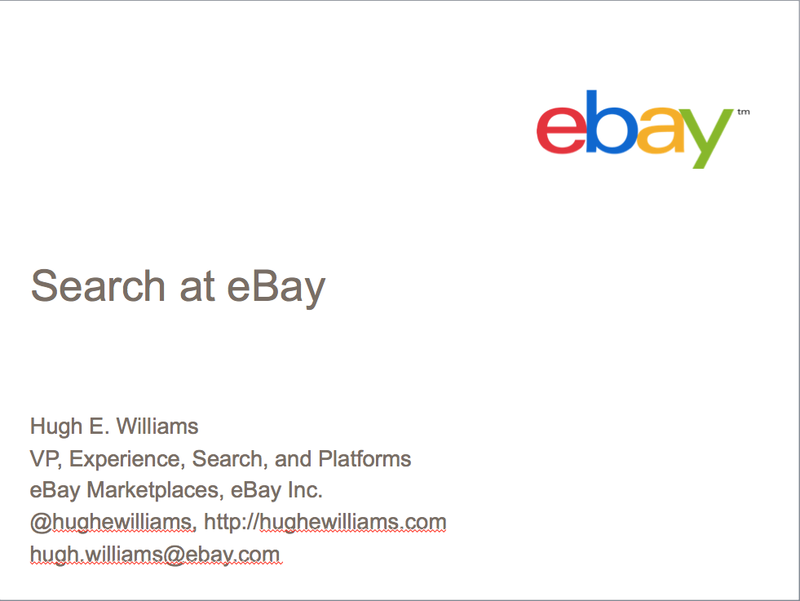 I gave a webinar last week on Search at eBay. Thank you to those who attended and asked great questions. The webinar was recorded and you can listen and view the slides here. Search at eBay. A tour of search from a recent webinar. In the webinar, I present a background of some of the facts and figures about eBay (an updated version of this post), a short introduction to how search works, and a tour of our current and future search platforms. The talk concludes with over thirty minutes of Q&A. The middle of the talk is dedicated to explaining how to sell successfully on eBay, and I summarize that advice in this post. Visibility in search is therefore important, but it isn’t sufficient to guarantee sales. You must also focus on ensuring buyers click on your item and make the choice to purchase it. On the first point: it’s true that most successful sales begin with a search on eBay, but many others occur through buyers finding items on another search engine, in an email, through the merchandizing that we feature, or through another source such as a social network. Searches on eBay also don’t always have a keyword: many buyers browse through our categories to find the item they want. If you focus on these three tenets, you will be successful in gaining visibility in search. We don’t offer specific answers to specific questions about how Best Match works on eBay. For example, we don’t comment on how we use each of the item specifics in search or whether having certain keywords in certain places in your titles matters. Why not? We want sellers to focus on the key tenets of Trust, Value, and Relevance, and not on specific features that may change or that might give sellers a short-term unfair advantage over other great sellers. Indeed, if a shortcut works today, it may not work tomorrow — we want a level playing field for all sellers, and we’re continually improving Best Match to use more Trust, Value, and Relevance information. 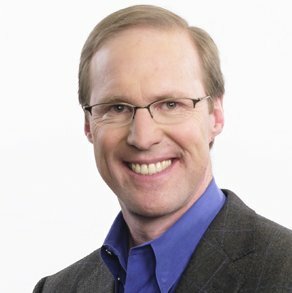 I encourage you to listen to the webinar for a richer explanation of how to sell successfully on eBay with a search-centric focus. See you next week. This entry was posted in technology and tagged ebay, search, webinar on June 17, 2013 by Hugh E. Williams.